products such as furniture, bedding, drapes, towels, rugs, china, and silverware. The youngest of four children, Ralph Lifshitz was born in the Bronx, New York, on October 14, 1939. His father was a house-painter. Ralph became interested in clothes when he was in seventh grade. While attending DeWitt Clinton High School in New York, he worked part-time for New York department stores, saving his money to buy clothes. He changed his name to Lauren in the mid-1950s. After graduating from high school he worked as a salesman and began studying business at night. He quit school after a few months, spent time in the army, and then looked for a job in fashion. In 1967 Lauren was hired by Beau Brummell Ties as a designer. His wide, colorful ties were the opposite of the narrow dark neckties common at the time; they sold well and started a new trend. Lauren started his own company and the next year launched a line of men's clothing, Polo, offering styles that were a mix of English and American styles and that expressed an image of class. Lauren's menswear was a success, and in 1971 he introduced his women's line. As the years went by he continued to branch out into children's clothes, colognes, footwear, home products, and other merchandise. Lauren designed costumes for the films The Great Gatsby (1973) and Annie Hall (1978) that influenced the way millions dressed. Modestly describing his work, Lauren stated, "I believe in clothes that last, that are not dated in a season. The people who wear my clothes don't think of them as fashion.' Lauren's vision was to represent American style with a dash of British elegance and the comfort of natural fibers. Lauren lived the image he projected, and he was often featured with his family in magazines devoted to lives of the rich and famous. He was also the first designer to appear in his own advertising. One of the secrets of Lauren's success lay in his attention to detail, always checking product quality and maintaining tight control over the brand image he crafted so carefully. Lauren's fashion formula earned many honors from his peers. He had seven Coty design awards and was inducted into the Coty Hall of Fame in 1986. In 1992 he received the Lifetime Achievement Award from the Council of American Fashion Designers and a tribute for twenty-five years of impact on American style from the Woolmark Awards. The Council of Fashion Designers later elected him Designer of the Year in 1996. In 1971 Lauren opened his first retail store in Beverly Hills, California, building toward a total of 116 Polo-Ralph Lauren stores in the United States as well as 1,300 boutiques (small shops within department stores). In 1986 he made fashion retailing history with a large megastore housed in the elegant former Rhinelander Mansion in New York. John Fairchild, chairman of Women's Wear Daily, called it "The best boutique in America, probably the world." Consumers responded, spending over $5 billion a year by 1997 to have the Lauren look and making him the best-selling designer in the world. Two major new ventures begun in 1995 took Lauren into the highly competitive blue jean and mass-market women's clothing categories. Both took the Lauren name to a new customer at lower prices and were instant hits. In 1996 Lauren's Home Collection contributed about $535 million in sales world-wide—more than any other designer. Paints were launched the same year, along with instruction videos and all the tools needed to create the living environment of one's choice. By 1997 investment bankers were fighting for the opportunity to help Lauren put his company on the stock market. In 1998 Lauren announced that his company would donate $13 million to the Smithsonian Institution in Washington, D.C., mainly to preserve the original American flag that inspired the writing of "The Star-Spangled Banner" in 1812. That same year he was honored for his efforts to raise money for research into a cure for breast cancer. In 2000 the company's Web site, Polo.com , was introduced, allowing online access to all Ralph Lauren products. Lauren's charitable contributions continued with the creation of the Polo Volunteer Program and the contribution of $5 million to establish the Ralph Lauren Center for Cancer Prevention and Care at North General Hospital in Harlem, New York. Canadeo, Anne. Ralph Lauren: Master of Fashion. Ada, OK: Garrett Educational Corporation, 1992. Milbank, Caroline Rennolds. NY Fashion: The Evolution of American Style. New York: Abrams, 1989. Trachtenberg, Jeffrey. 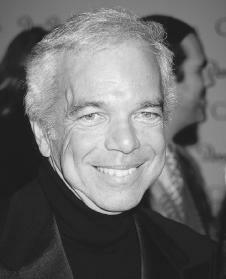 Ralph Lauren: The Man Behind the Mystique. Boston: Little, Brown, 1992. I'm a seventh grader in Barnhart Middle School and I want to be a fashion designer too. This article is really going to help me. I'm also doing research on Vera Wang, Chanel, Prada and other designers, do you have helpful articles or life stories about them too?